You are here: Home / Diary / SO HOW DID WE GO? Hotshots 2 from 4 yesterday. Daily Feature won. SO HOW DID WE GO? Hotshots 2 from 4 yesterday. Daily Feature won. Tuesday we posted our two meetings and if you clicked the read more at the bottom of the home page you would have seen the format okay. I believe we found 7 winners from the 16 races which is right on normal although the range of prices may have been slightly below expectations but on a very small sample that is just how it is. In our previous concept we gave no allowance for the win strike of selections as we included maidens we only used place % ranking. It does mean that all runners in maidens should get the same rating as before. In 2017 the race strike rate was 45% and av div $3.94 and this year 44% and $3.92 so effectively the same. The strike rate of favourites was 37% exactly in both years. Compared to favourites generally that manes we are 4% ahead of the game and all we have to do is watch the market and if we strike as soon as the runner firms, we will make a level stakes profit as the vast majority of favourites either firm from this point or stay the same. Our data base only looks at the final figure. That diference on our studies means an extra $25 per $9.25 per 100 selections on one dollar outlays per selection. And the charts are clear. Second favourites lose 7.5% on turnover and as the starting prices of the selections get longer the losses per selection get higher. So what would you choose? The favourite when in the HR2D top two or the longer priced one? That,s not to say the non favourites are hopeless, they still produced 50% of the winners but simply put, we can be extremely confident of getting the winner in the Top Two if one of our selections is the favourite, in fact our strike rate in those races is better than 50%. Todays highlighted book is Winning With Favourites and for all new subscribers to HR2D Top Two received today you will get this book for no extra charge. 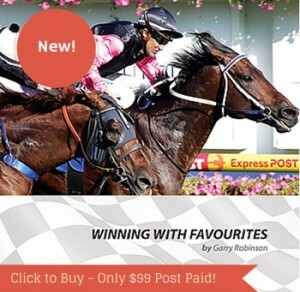 https://horseracingaustralia.info/newsite2015/wp-content/uploads/2015/07/logo-2015-100.jpg 0 0 Garry Robinson https://horseracingaustralia.info/newsite2015/wp-content/uploads/2015/07/logo-2015-100.jpg Garry Robinson2018-12-06 08:55:182018-12-06 08:55:18SO HOW DID WE GO? Hotshots 2 from 4 yesterday. Daily Feature won.